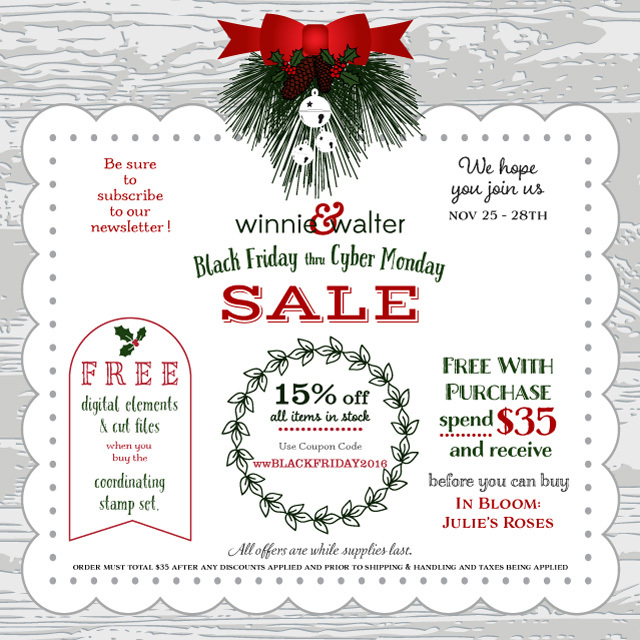 winnie & walter blog: Yes, the w&w Black Friday - Cyber Monday Sale is On! Yes, the w&w Black Friday - Cyber Monday Sale is On! We want to share how very thankful we are for you! We are so blessed to be a part of your lives and that you use w&w products to make something handmade and beautiful--what a privilege and honor you bestow upon us each and every day! Every comment, email, post, project and link shared warms our hearts. Thank you. Part of Thanksgiving is giving back. Yes, Black Friday is a commercial event, but it also about us sharing with you. Come back Friday at midnight CST here on the w&w blog for inspiration for our free with qualifying purchase stamp set. This one is not limited edition, but it will not officially be released until 2017. Time to knock some items off my wishlist! Enjoy Thanksgiving tomorrow & hope your sale is a great success! I'm thankful for your wonderful products & great customer service!